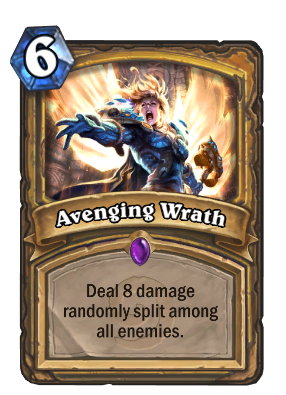 In a world were Paladin goes face, 8 damage worth of burn is preeeeeeeetty good! I love how most of reviews here say about dusting it, or comparing it to Arcane Missiles and now this is a very good card in a meta-deck. It's often used against me as a finisher. I mean, if they empty your board, it's a 6 mana deal 8 to face. Basically a mini-pyroblast, or a bigger fireball. 3 1 mana mage cards = this card. Boy did Rhonin ever look good. Costs 2 less draws. Not to say that this card is good as is, but the comparison is very unfair. I play these with my Secret Pally. Can almost hear the other guy screaming WTF WTF WTF!! Just got a gold one, considering disenchanting because I can't fit it in any decks....but......but ITS SO PRETTY!!!!!!!!!!!!!!!!! Got the golden version... To dust, or not to dust? Dust if you have 2 non-golden. But, but... you're not paenser?! Lol, you wrote Man ! !